Earthquakes are the sudden, rapid shaking of the earth, caused by the breaking and shifting of subterranean rock as it releases strain that has accumulated over a long time. Initial mild shaking may strengthen and become extremely violent within seconds. Additional earthquakes, called aftershocks, may follow the initial earthquake. Most are smaller than the initial earthquake but larger magnitude aftershocks also occur. Earthquakes can happen at any time of the year and occur without warning, although they usually last less than one minute. Aftershocks following the initial earthquake may occur for hours, days, or even months. All 50 states and 5 U.S. territories are at some risk for earthquakes. and areas on the east coast including the mid-Atlantic, coastal South Carolina and New England. In California and the western U.S. States, earthquake faults can be hundreds of miles long and be visible on the surface of the earth. In the central U.S. however, faults are buried deep underground and are generally categorized as “seismic zones”, or areas where many smaller faults are clustered together to produce seismic activity. 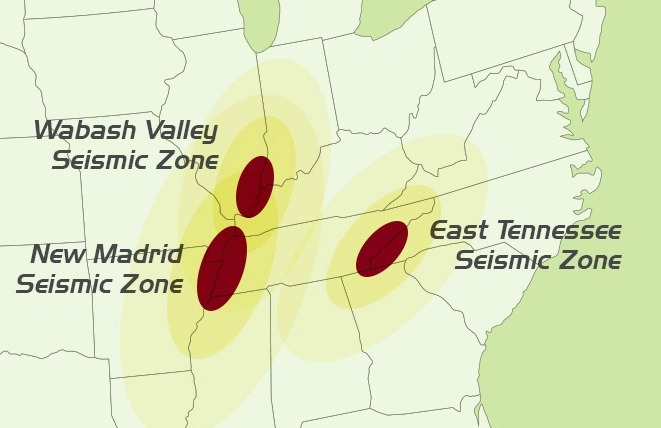 While some zones, such as the New Madrid Seismic Zone, may be more widely known, others such as the East Tennessee and Central Virginia Seismic Zones can also produce damaging earthquakes at any time. Before an earthquake occurs, secure items that could fall or move and cause injuries or damage (e.g., bookshelves, mirrors, light fixtures, televisions, computers, hot water heaters. Move beds away from windows and secure any hanging items over beds, couches, cribs or other places people sit or lie. Locate master switches and shutoff valves for all utilities and know how to turn them off. Plan and practice how to Drop to the ground, Cover your head and neck with your arms, and if a safer place is nearby that you can get to without exposing yourself to flying debris, crawl to it and Hold On to maintain cover. COVER your head and neck with one arm and hand . If a sturdy table or desk is nearby, crawl underneath it for shelter. If no shelter is nearby, crawl next to an interior wall (away from windows). Stay on your knees; bend over to protect vital organs. HOLD ON until shaking stops . Under shelter: hold on to it with one hand; be ready to move with your shelter if it shifts. No shelter: hold on to your head and neck with both arms and hands. Wherever you are, stay there! Most injuries occur when people try to enter or exit buildings. If indoors, take cover under heavy furniture or against a wall. Stay away from glass, bookshelves, or wall hangings. If outside: Move into the open. Stay away from buildings and utility wires. If you're driving: Stop quickly (but safely)and stay in the vehicle. Examine utility lines, chimneys and appliances for damage. If you see damaged water pipes, cut off the water supply at the main valve. If you smell natural gas, shut off the main valve and open windows. Leave the building and call local officials. Don't use open flames or turn on electrical devices until instructed. Listen to the radio for official updates or instructions. Inspect ceilings and foundations for cracks or signs of weakness. Have them repaired. Store chemicals and breakables items in low, closed cabinets wit latches. Place heavy object on lower shelves. Bolt or strap cupboards, shelves, and bookcases securely to walls. Brace overhead light fixtures. Hang heavy items (such as pictures) securely and away from where people sit. Secure water heaters by strapping them to wall studs and bolting them to the floor. Install blots to connect your home to its foundation. Strap down televisions, computers, and other heavy objects that can shift during a quake.